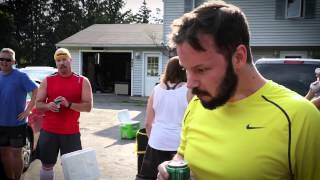 The 4th Annual Cream Ridge Beer Mile was an exciting event filled with new highs. The unstoppable Drew Caffery once again broke his course record with an amazing 7:22. For the first time we had 3 solo female runners. Considering the 3-month old Genny Bock that was this year's official beer, some incredible finishes were put in by all.